United Automobile – Leyland Leopard – 7462 PT – W 5 ? Established in the early 1920‘s, Wilkinson Motor Services were an independent based in the Durham Mining Village of Sedgefield. They had a well-maintained fleet of quality vehicles, which to the best of my knowledge were all single deck, and mostly AEC and Leyland with a couple of Bedford’s thrown in for good measure. Their livery was red and cream, with cream being the dominant colour. Other than that, I don’ t know a great deal about them. Wilkinson became part of United in 1967; when United gained control of the independent, their usual practice was that any none standard BTH vehicles acquired in the process either became part of the Durham District fleet, or were disposed of as quickly as possible, however, this was not the case with Wilkinson’s fleet. The vehicles were repainted and numbered with a ‘W’ prefix, however, this was 1967, and the new Government were about to start the formation of NBC, and is probably the reason the Wilkinson fleet survived into the new era. As we know the newly created NBC, promptly set about destroying, sorry, ‘redistributing’ long established fleets, and scattering them all over the place. The Wilkinson depot closed, but this is one of four C43F Plaxton bodied Leyland Leopard L2 coaches, 7462&3 PT from 1962 and 3564&5 UP from 1963; which stayed with United, but I’m not entirely sure where the remainder of the fleet ended up. Both Wilkinson and United, had very high standards, but for some reason ‘unless its just happened’ this one has some damage around the grill, and one of the foglights. The 30ft model is in my top 5 good looking coaches of all time. I completely agree as long as you mean the 1963/64 version with the improved back end. If you saw this Wilkinsons machine from behind I think that you’d be hard pushed to describe it as a classic! Nearly 50 years on I still remain undecided about the Ogle design which replaced this model in 1965. In some liveries it looked quite futuristic and imaginative, in others weird for the sake of it. I always thought that the ex-Wilkinson coaches looked very nice in the olive green and cream United livery. Wilky’s livery was a bit bland. 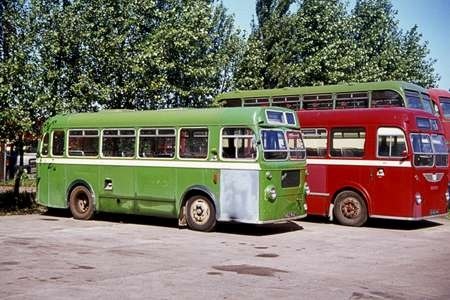 Another non standard United batch were the nine Leyland Royal Tigers which looked simply glorious in the olive green and cream livery – mind you, it would be a sorry vehicle which couldn’t look good in those classic colours !! I wonder if I may offer a few corrections and clarifications to Ronnie’s caption above. Firstly, Sedgefield was never a mining village; it is situated just outside and to the South East of the edge of the Durham coalfield. Having said that, the closest pits – at Fishburn (closed 1973) and Bishop Middleham (closed 1936) were both only 3 miles away. Sedgefield’s background, though, is purely agricultural. You’re quite correct, Ronnie, that the fleet was always single-deck although the services, unusually for this part of the county, didn’t pass under any low bridges. There is a mystery surrounding one particular bus (16, UP5438), however, inasmuch as, although this was an all-Leyland Lion which served Wilkie’s for 19 years between 1931 and 1950, an official Leyland photograph exists (and is shown in the Cardno/Hillerby history of Wilkinson’s Motor Services) of a Leyland Titan, apparently in the livery of a Welsh operator (Vanguard) but clearly displaying the same registration number! The distribution of AECs and Bedfords over the years was equal (8 of each) but the fleet, from 1930 onwards, was predominantly Leyland. At the time of the sale to United, however, the fleet was 7 AECs, 6 Leylands and 1 Bedford with 3 Leylands on order. 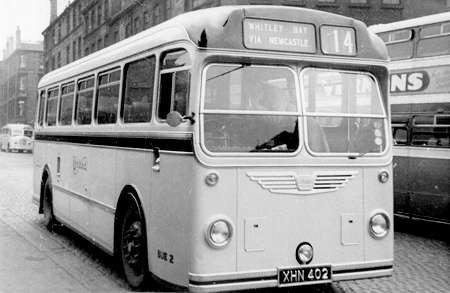 Wilkie’s ceased to exist on 26 February 1967 but your suggestion that, when United acquired non-BTH standard vehicles from an acquired independent, they were either disposed of quickly or transferred into the Durham District Services fleet is misleading. During the relatively short life of the DDS, United acquired the services of eight independents; of these, Wilkinson’s was the last. Of the others – Heather Motor Services of Robin Hood’s Bay, W.C.Radley & Son (‘Dauntless Motor Service’) of Eldon Lane (a village near Bishop Auckland), James & Mosley of Croft Spa, M Hardy of Darlington, Scott’s Greys of Darlington, Forge Valley Motors of Scarborough and Norfolk’s Motor Service of New Ridley – only Radley’s vehicles were acquired but, of the five owned, four were promptly offered for resale and only one (a Bedford SB) was taken into the fleet; it was never allocated a fleetnumber, however, never actually operated by United and sold within about four months of the takeover. 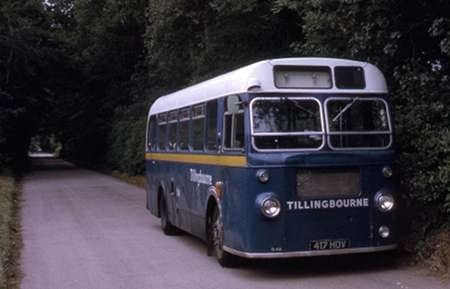 Thus, no acquired vehicles were transferred to the DDS fleet although the DDS company was itself formed from the acquisition of three independents – Darlington Triumph, ABC Motor Service and the Express Omnibus Company. 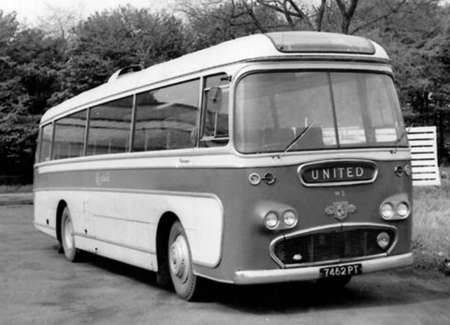 The entire Wilkie’s fleet of 14 buses (two of which had originated with Scurr’s of Stillington) and coaches was taken into the United fleet as well as the 3 additional vehicles which were on order at the time of takeover and entered the United fleet between June and August of 1967; they were allocated the fleetnumbers W1-W17 rather than being given the appropriate code for their chassis type. 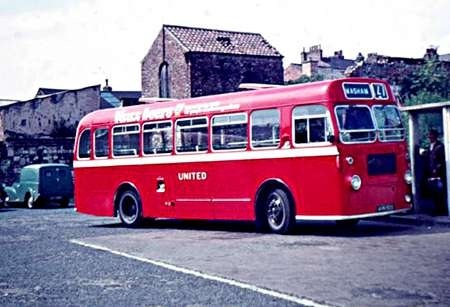 The fleetnumber for 7462UP is correct; it was originally Wilkie’s 62, became United W5 on takeover and eventually became 4002 in the January 1969 renumbering, at which time the 17 ex-Wilkinson’s buses were all still operated. "The Wilkinson depot closed". Well, yes it did, but not for some years after the United takeover. The ‘depot’ at Sedgefield was actually two quite separate premises about half a mile apart. These were the Parkside garage – where W5 is photographed – on the outskirts of the village prior to its recent expansion, where the majority of the fleet was garaged and major servicing carried out, and North End, closer to the centre of the village with garaging for four buses as well as being the location of the offices, crew room and even a small filling station and car repair facility. Sedgefield depot didn’t close until November 1984. Parkside garage was demolished and developed many years ago and, today, it’s impossible to imagine that it was once a bus garage. The premises at 46 North End, however, although now the base of Wright Construction, are little changed and immediately recognisable. Shamefully, although I lived a hundred yards or so further up North End for over 30 years until a few months ago, I never photographed it in its days as a bus garage! As a former YTC mechanic and a summertime week-end PSV driver I well remember smashing my less than a year old ‘gold 21st present watch’ whilst attempting to select gears on 1235 fleet no Leyland Leopard on the Doncaster Barnsley service. Leyland (in their wisdom) had decided to introduce a hydraulic clutch system into their early leopards using a completely new clutch pressure plate. Why? Nobody knows. The old tiger’s clutch was always good enough, and had served the 0600 engine well since c1949. Probably some ‘Whizz Kid’s’ idea straight from some venerable seat of learning. Anyway he cost me a new watch. £35 as I recall a heap of money at the time and almost three weeks wages.